1. Effective School Year (SY) 2012-2013, the K to 12 Basic Education Curriculum (BEC) shall be implemented starting with the roll-out of Grades 1 and 7 in all public elementary and secondary schools. Private schools are enjoined to do the same. They may further enhance the curriculum to suit their school vision/mission. 3. 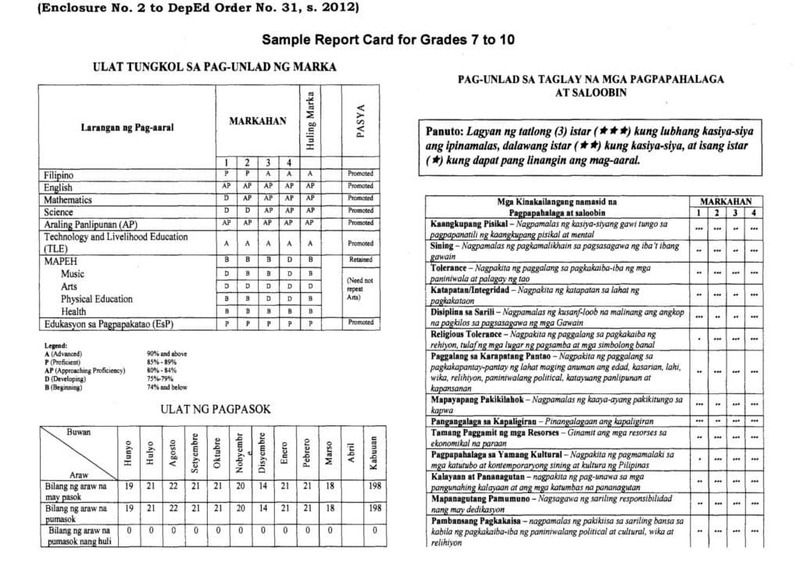 The Sample Report Card for Grades 1 to 6 and Grades 7 to 10 are in Enclosure No. 2. 4. Schools are challenged to implement the guidelines in creative and innovative ways, for the curriculum can be localized without compromising the philosophy of total learner development. 5. At the end of every quarter, the end users of the Curriculum Guide are encouraged to send their feedback to the Division Office which will submit these reports to the Central Office (Attention: Dr. Yolanda S. Quijano, Undersecretary for Programs and Projects) through the Regional Office (RO). 6. Immediate dissemination of and strict compliance of this Order is directed. The overall design of Grades 1 to 10 curriculum follows the spiral approach across subjects by building on the same concepts developed in increasing complexity and sophistication starting from grade school. Teachers are expected to use the spiral/progression approach in teaching competencies. The desired outcomes of grades 1 to 10 program are defined in terms of expectancies as articulated in the learning standards. In general terms, students are expected at the end of Grade 10 to demonstrate communicative competence; think intelligently, critically and creatively in life situations; make informed and values-based decisions; perform their civic duties; use resources sustainably; and participate actively in artistic and cultural activities and in the promotion of wellness and lifelong fitness. These general expectancies are expressed in specific terms in the form of content and performance standards. These expectations are unpacked in the Curriculum Guide in terms of learning competencies which can be adopted in the teaching-learning plan as instructional objectives. The content standards are stated in broad terms, i.e., “students are expected to demonstrate understanding of…” so that teachers, on the one hand, can differentiate how students will manifest their understanding, and students, on the other hand, can have the option to express their understanding in their own way. Thus, students are not just expected to understand, but they should be able to demonstrate or provide evidence of that understanding. Evidence-based understanding, therefore, makes the content standards measurable. English Focused on the development of literacy and numeracy skills and learning of concepts first in the Mother Tongue from Grades 1-3 and later transfer to second language (Filipino and English) The macro skills - listening, speaking, reading, writing and viewing spiral across grade levels and across languages. The ultimate goal is communicative competence both oral and written in three languages. Ang Filipino ay naglalayong malinang ang (1) kakayahang komunikatibo at (2) kahusayan sa pag-unawa at pagpapahalagang pampanitikan ng mga mag-aaral. Lilinangin ang makrong kasanayan (pakikinig, pagsasalita, pagbasa, pagsulat at panonood) sa tulong ng iba’t ibang dulog at pamamaraan tulad ng Komunikatibong Pagtuturo ng Wika (KPW), Pagtuturong Batay sa Nilalaman (PBL) ng iba’t ibang akdang pampanitikan at Pagsasanib ng Gramatika sa Tulong ng iba’t ibang Teksto (PGRT), at isinasaalang-alang din ang pagsasanib ng mga pagpapahalang pangkatauhan sa pag-aaral at pagsusuri ng iba’t ibang akdang pampanitikan. SCIENCE Science education aims to develop scientific literacy among students that will prepare them to be informed and participative citizens who are able to make judgements and decisions regarding applications of scientific knowledge that may have social, health, or environmental impacts. The science curriculum recognizes the place of science and technology in everyday human affairs. It integrates science and technology in the civic, personal, social, economic, and the values and ethical aspects of life. The science curriculum promotes a strong link between science and technology, including indigenous technology, keeping our country’s cultural uniqueness and peculiarities intact. This course deals with the basic concepts in Biology, Chemistry, Physics and Earth/Space Science. Every quarter presents the different science disciplines across grade levels in increasing complexity. The course is focused on the development of awareness and understanding of practical everyday problems that affect the learners’ lives and those around them. MATHEMATICS Elementary mathematics covers basic concepts and ideas, skills and processes on numbers and number sense-geometry, measurement, patterns and algebra, probability and statistics as enlist, using appropriate technology in critical thinking, problem solving, reasoning, communicating, making connections, representations and decisions in real life. It includes key concepts and principles of number sense, measurement, algebra, geometry, probability and statistics as applied, using appropriate technology, in critical thinking, problem solving, reasoning, communicating, making connections, representations and decisions in real life. ARALING PANLIPUNAN (AP) Ito ay asignatura na nagtuturo ng mga konsepto sa pananagutang pansarili, pamilya, kapwa, bansa/daigdig at Diyos; pananagutan para sa kabutihang panlahat upang mamuhay nang may kaayusan, katiwasayan, kaunlaran tungo sa kaligayahan ng tao. Ang asignaturang ito ay naglalayong tumalakay sa kasaysayan ng Pilipinas gamit ang sipi ng mga piling primaryang sanggunian mula sa iba’t ibang panahon at uri; at magpamalas ng malalim na pang-unawa sa mga pangunahing kaisipan at mga napapanahong isyu sa pag-aaral ng kasaysayan, pamahalaan, kultura at lipunan ng mga rehiyong Asyano; kasaysayang pandaigdig at napapanahong isyu; at ang kaisipan at napapanahong isyu sa ekonomiks at pambansang pag-unlad. EDUKASYONG PANTAHAN AT PANGKABUHAYAN (EPP)/TECHNOLOGY AND LIVELIHOOD EDUCATION (TLE) Edukasyong Pantahanan at Pangkabuhayan develops knowledge, skills, values and attitude in Agriculture, Entrepreneurship and Information Communication Technology (ICT), Home Economics and Industrial Arts that can help improve self, family and community life considering sustainable development. Technology and Livelihood Education (TLE) provides an enriched general education that will prepare our graduates for higher education, world of work and lifelong learning. The integration of Entrepreneurship concepts such as Personal Entrepreneurial Competencies (PECS), Environment and Market (E & M), and Process and Delivery prepares the students for gainful employment and to set up their own business in the areas of Agri-Fishery Arts, Industrial Arts, Home Economics, and Information and Communication Technology. MUSIC, ART, PHYSICAL EDUCATION AND HEALTH (MAPEH) The Music Program focuses on the learner as the recipient of the knowledge, skills, and values necessary for artistic expression and cultural literacy. The curriculum design is student-centered, based on spiral progression, and grounded in performance-based learning. Thus, the learner is empowered, through active involvement and participation, to effectively correlate music and art to the development of his/her own cultural identity and expand his/her vision of the world. The Art Program provides our Filipino learners with art experiences that include recognizing, creating, appreciating, and critiquing their own artistic works and the works of others. From Kindergarten, art instruction begins with creative exploration of art materials, concepts and processes found in the Philippines and other countries. It continues to develop the student’s imagination and individual expression, and inquiry into the aesthetic qualities of his work, the work of others, artists of the past and present, from the Philippines and from other parts of the world. It culminates in seeing the connection of art to other areas of study and exposure to various art-related activities and careers. The Physical Education Program is anchored on the tenet “Move to Learn and Learn to Move” with ultimate goal of achieving life long fitness. It shall contribute to the development of fitness, health and wellness among school-age students as provided in the program’s rich and challenging physical activity experiences. It shall promote the development of a participative and active body; learning to use the body in moving efficiently and effectively in a given space time, effort and assurance of quality movement. The desire for becoming a physical educated person, thus aid an individual in successfully selecting and participating activities appropriate at various stages of life. The Health Program from Kindergarten to Grade 6 focuses on the physical, mentalm emotional, social, moral and spiritual dimensions of health and enables the learners to acquire essential knowledge, attitudes, and skills necessary to promote good nutrition, prevent and control diseases and substance use and abuse, reduce health-related risk behaviors.to prevent and control injuries with the end in view of maintaining and improving personal, family community, national and global health. This learning area covers four (4) major components namely: Music, Art, Physical Education and Health. • Music and Art deal with the study of man’s aesthetic expression through sounds (music) and visuals (art) mirroring the sentiments and ideas of society and culture, and contributing to the development of individual and collective identity. It is designed to be student-centered, based on spiral progression, and grounded in performance-based learning focused on appreciation and application where basic fundamentals are further reinforced. The program design empowers the learners to effectively correlate Music and Art to the study of Philippine Culture, as influenced by history, the culture of its neighbors, and the effects of globalization and the advancement of information technology. • Physical Education and Health promote the development of active and healthy lifestyle. Physical Education focuses on five strands namely: body management, movement skills, games and sports, rhythm and dance and physical fitness. Each strand is sequentially developed across grade levels including activities that are varied and age-appropriate to address the needs and interest of learners. The Health program deals with physical, mental, emotional, social, moral and spiritual dimensions of health that enable learners to acquire essential knowledge, attitudes and skills necessary to promote good nutrition, prevent and control diseases, substance use and abuse, and reduce health-related risk behaviors and injuries with the view to maintaining and improving personal, family, community, national and global health. EDUKASYON SA PAGPAPAKAT AO (EsP) Ang Edukasyon sa Pagpapakatao (EsP) ay asignaturang bahagi ng K to 12 na gagabay at huhubog sa mga kabataan. Ang tunguhin o outcome ng EsP ay kabataang nagpapasya at kumikilos nang mapanagutan tungo sa kabutihang panlahat. Nangangahulugan ito na lilinangin at pauunlarin ang pagkataong etikal ng bawat mag-aaral. Upang maipamalas ito, kailangang magtaglay siya ng limang pangunahing kakayahan (macro skills): pag-unawa, pagninilay, pagsangguni, pagpapasya at pagkilos. Ang Edukasyon sa Pagpapakatao ay naglalayong malinang at mapaunlad ang kakayahan ng mga mag-aaral sa moral na pagpapasya at paggawa ng mga pasyang batay sa idinidikta ng tamang konsensya. Apat na tema ang nililinang sa paraang expanding spiral mula Kindergarten hanggang Grade 10: (a) Pananagutang Pansarili at Pagiging Kasapi sa Pamilya, (b) Pakikipagkapwa at Katatagan ng Pamilya, (c) Paggawa Tungo sa Pambansang Pag-unlad at Pakikibahagi sa Pandaigdigang Pagkakaisa, at (d) Pagkamaka-Diyos at Preperensya sa Kabutihan. Ang nilalaman at istraktura ng Edukasyon sa Pagpapakatao ay nakaangkla sa dalawang disiplina: Eithics at Career Guidance. Ang Etika ay ang siyensya ng moralidad ng kilos ng tao. Ang Career Guidance ay ang paggabay sa mag-aaral na magpasya ng kursong akademiko o teknikal-bokasyonal na tugma sa kanyang mga talento, kakayahan at aptitude at mga trabahong kailangan sa ekonomiya kakayahan at aptitude at mga trabahong kailangan sa ekonomiya. Mother Tongue (MT) shall be used as the medium of instruction and as a subject from Grade 1 -3. English or Filipino is used from Grade 4 to 10. Both languages are taught from Grade 1 to 10. The matrix below shows the specific medium of instruction per learning area and per grade level. The time allotment for each subject is the minimum period for class interaction. The learning time can be extended to include off-school learning experiences at home or in the community for transfer of learning to real-life situations as provided for in the curriculum. The outputs of such off-school learning experiences are usually in the form of products and performances which shall be monitored and credited accordingly. Modules shall be provided as the basic learning resource. These are self-instructional materials that lend themselves to independent and cooperative learning. For schools with connectivity, web-based resources and video materials are encouraged to be used to enrich and deepen students’ understanding. Existing textbooks may still be used where appropriate. Resources for Teachers include teaching guides, prototype lesson plans, lesson exemplars, matrix of existing books, workbooks, and modules. The assessment process is holistic, with emphasis on the formative or developmental purpose of quality assuring student learning. It is also standards-based as it seeks to ensure that teachers will teach to the standards and students will aim to meet or even exceed the standards. The students’ attainment of standards in terms of content and performance is, therefore, a critical evidence of learning (The details of assessment and rating system in a separate DepEd Order). “Knowledge” refers to the substantive content of the curriculum, the facts and information that the student acquires. “Process” refers to cognitive operations that the student performs on facts and information for the purpose of constructing meanings and understandings. “Understandings” refers to enduring big ideas, principles and generalizations inherent to the discipline, which may be assessed using the facets of understanding. “Products/Performances” refers to real-life application of understanding as evidenced by the student’s performance of authentic tasks. Beginning- The student at this level struggles with his/her understanding; prerequisite and fundamental knowledge and/or skills have not been acquired or developed adequately to aid understanding. Developing- The student at this level possesses the minimum knowledge and skills and core understandings, but needs help throughout the performance of authentic tasks. Approaching Proficiency- The student at this level has developed the fundamental knowledge and skills and core understandings and, with little guidance from the teacher and/or with some assistance from peers, can transfer these understandings through authentic performance tasks. Proficient- The student at this level has developed the fundamental knowledge and skills and core understandings, and can transfer them independently through authentic performance tasks. Advanced- The student at this level exceeds the core requirements in terms of knowledge, skills and understandings, and can transfer them automatically and flexibly through authentic performance tasks. P for Proficient; and A for Advanced. At the end of the four quarters, the Final Grade for each learning area shall be reported as the average of the four quarterly ratings, expressed in terms of the levels of proficiency. The general average shall be the average of the final grades of the different learning areas, also expressed in terms of levels of proficiency with the numerical equivalent in parenthesis. 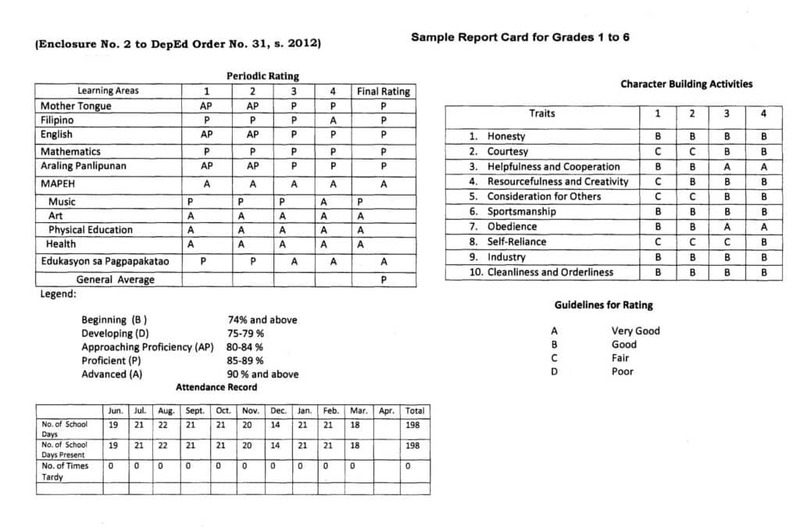 Sample Report Cards are in Enclosure 2.a and 2.b. Promotion and retention of students shall be by subject. Students whose proficiency level is Beginning (B) at the end of the quarter or grading period shall be required to undergo remediation after class hours so that they can immediately catch up as they move to the next grading period. If by the end of the school year, the students are still at the Beginning level, then they shall be required to take summer classes. As a matter of policy every learning deficiency should be bridged even for those students whose level of proficiency is above the Beginning level. The guidelines for bridging gaps in learning are in a separate DepEd Order. Honor students shall be drawn from among those who performed at the Advanced Level. Subsequent guidelines shall be issued as basis for ranking of honors. The total time daily does not include off-school learning experiences that teachers may require outside of school hours for the production of products and performances as evidence of transfer of learning. At the end of the every quarter, schools are encouraged to put up exhibits of student products across subjects as culminating activity. Students may also do an exhibition of their performance in different subjects as evidence of their learning or attainment of performance standards. Thus, when parents receive the report card and confer with teachers they will actually be witnessing what students are learning in school. Ito ay asignatura na nagtuturo ng mga konsepto sa pananagutang pansarili, pamilya, kapwa, bansa/ daigdig at Diyos; pananagutan para sa kabutihang panlahat upang mamuhay nang may kaayusan, katiwasayan, kaunlaran tungo sa kaligayahan ng tao; kasaysayan ng Pilipinas gamit ang mga sipi ng mga piling primaryang sanggunian mula sa iba’t ibang panahon at uri. Ang asignaturang ito ay naglalayong magpamalas ng malalim na pang-unawa sa mga pangunahing kaisipan ng mga napapanahong isyu sa pag-aaral ng kasaysayan, pamahalaan, kultura at lipunan ng mga rehiyong Asyano; kasaysayang pandaigdig; mga kaisipan sa ekonomiks at pambansang pag-unlad at napapanahong isyu at hamong panlipunan.